Then [the people questioning the man who had been healed of his blindness took him] to the Pharisees, because it was on the Sabbath that Jesus had made the mud and healed him. The Pharisees asked the man all about it. So he told them, "He put the mud over my eyes, and when I washed it away, I could see!" Some of the Pharisees said, "This man Jesus is not from God, for he is working on the Sabbath." Others said, "But how could an ordinary sinner do such miraculous signs?" So there was a deep division of opinion among them. Then the Pharisees again questioned the man who had been blind and demanded, "What's your opinion about this man who healed you?" The man replied, "I think he must be a prophet." 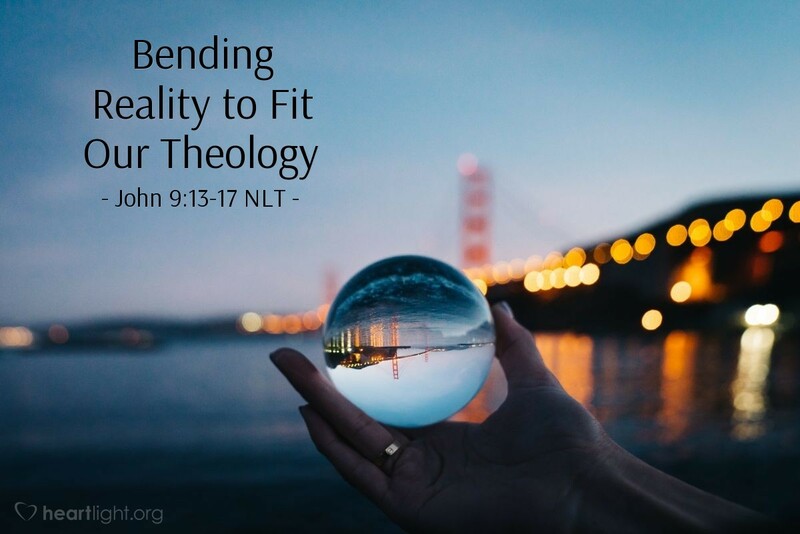 Isn't it interesting how we can "bend" reality to make it fit faulty theology? This man was healed. He was healed on the Sabbath. But, in the theological wrangling of the Pharisees, that "work" of healing was a violation of the Sabbath. So either Jesus was bad, or the man hadn't really been healed. Some disagreements on obscure or much-debated minor theological points are inconsequential. However, when we use disagreements to wall out and condemn people, or we use them to make God's good work appear to be something bad, then those theological positions become evil. That misuse of theological principles doesn't mean we water down the plain teaching of Scripture on morality or the nature of Jesus; it does mean that we should be a lot more humble and generous when it comes to the value of people. Dear Heavenly Father, please forgive me for the times that I have wrongly used your word to hurt other people. Empty me of my theological and doctrinal arrogance that could blind me to your work in the people around me. In Jesus' name, I pray. Amen.